An outbreak of common acne is bad enough, but when the acne is Cystic, you have to start a treatment regimen right away. Cystic Acne (also known as Nodulocystic Acne) is characterized by large, painful nodules on the face, neck, scalp, back, upper arms, chest and shoulders. Unlike less aggressive pimples, Cystic Acne does not disappear quickly on its own, and may take weeks, months or even years if left untreated. If they burst, they can spread the infection, causing more breakouts, and when they finally recede, they tend to leave scars: Atrophic Scars, Ice Pick Scars and Box Car Scars. A severe form of Cystic Acne is more common in men, but women get it too – usually in the lower half of the face. Medical treatments, like oral antibiotics and cortisone shots, are prescribed to fight outbreaks, but if you want an effective natural remedy without all the harsh chemicals, then Lavender Oil is a great choice. 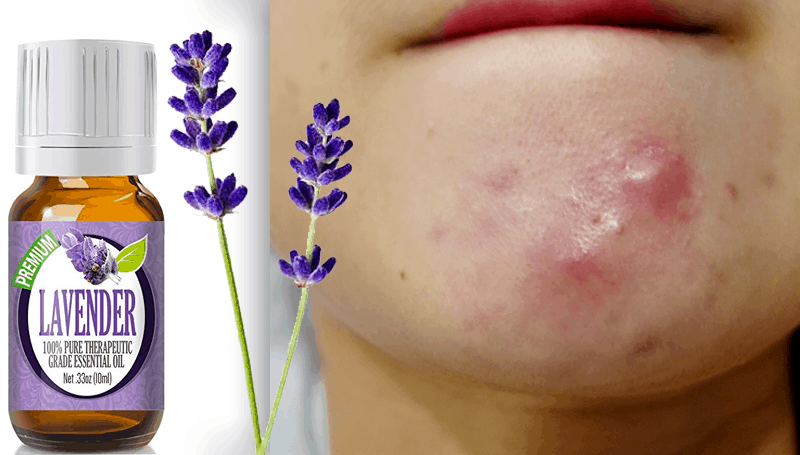 Lavender Essential Oil is often used for Cystic Acne because it is gentle on the skin and does not cause irritations that lead to overproduction of oil in the infected area. • Wash your face and apply Lavender Oil directly on the Cystic Acne spots before going to bed. If your skin is extra-sensitive, dilute it in a carrier oil like coconut or jojoba. The anti-microbial properties will target the surface bacteria, while aromatherapy benefits from the lavender will help you get a good night’s sleep and maintain your body’s hormonal balance. • A second way to use Lavender Essential Oil for Cystic Acne is to combine it with other essential oils that also have strong anti-bacterial properties. For example, Tea Tree Oil, Clary Sage Oil, Chamomile Oil and Geranium oil. Mix 2 or more of these oils in equal parts in a carrier of your choice and apply topically on the problem area before going to bed. • Mix 3 drops of Lavender oil with 2 tbsp of unfiltered apple cider vinegar and 2 tbsp of water. Apply on the Cystic Acne like a spot treatment before going to bed. • Make a paste with 1 tbsp baking soda and water. Add 2-3 drops of therapeutic grade lavender oil and apply on the Cystic Acne at least 2-3 times a week. • Fuller’s Earth, is a special kind of clay that is often used in natural beauty treatments because it gets rid of excess oil and leaves the skin feeling soft and smooth. Make 1 tbsp of paste by mixing Fuller’s Earth and water, and add 2-3 drops of lavender oil in it. Use topically. • Organic Manuka Honey has strong anti-bacterial properties and it is one of the most powerful kinds of honey to use for cystic acne. Mix 2-3 drops of lavender essential oil in 1 tbsp of Manuka Honey and apply as spot treatment. • Pure Neem Oil works really fast to clear up cystic acne-causing bacteria and reduce inflammation and redness. Mix Lavender Oil and Neem Oil in equal parts and apply to the problem area before going to bed. • If you can get hold of an aloe vera leaf, keep it in the fridge and cut into it every day to extract some of the jelly that is stored inside. If that is not possible, buy aloe vera gel and it should work just as effectively. Mix 2-3 drops of lavender oil in the aloe vera gel and apply on the cystic acne. • Raw potato does a great job of extracting excess oil, dirt and grime from the skin. Grate a raw potato and squeeze out 1 tbsp of juice. Mix 2 drops of lavender oil in it and apply on the cystic acne outbreak. • Never use perfume-grade lavender oil to treat Cystic Acne. It will have no impact at all. Use therapeutic-grade lavender oil only. It is a little more expensive, but these are the ones that have medicinal and healing properties. 1) Place ice cubes on them. 2) Disinfect all your pillows and towels regularly. 3) Eat more fibrous foods rich in probiotics and Vitamin A. 4) Try to avoid sugar, caffeine, chocolate, fried foods, spicy foods and conventional diary products like milk, cheese and ice-cream. 6) Exercise more. It will get your lymphatic system going and help to detoxify the body. 7) Ensure that you sleep well at night because stress and fatigue make cystic acne problems worse. 8) Resist the urge to pop them.